Summary: This picture book takes the reader on a journey through the months of year, briefly touching on time/number association and the days of the week, via poetry. The author crafts poems that speak to activities and the season normally associated with each month. She uses very traditional artwork to illustrate the stories of each poem. The artwork is a combination of pencil and color illustrations. This is the mini-edition of the classic 1927 book by the author. Literary elements at work in the story: Two primary themes used in Around the Year to get the message of this picture book across are illustration and poetry. The cadence of the poetry (at times) has a way of captivating the listener’s/reader’s attention. In addition, the language and message of the various poems are very identifiable to all types of audiences. The artwork draws you in due to its close proximity of the words/story of the poems, and the combination of pencil artwork on one page and color on the other works well together. How does the book present gender, race, culture, economic status, abilities/disabilities, age, etc. 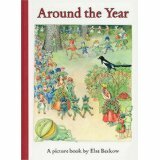 in the story: The message of the book seems to be in line with educating little ones primarily on the months of the year by drawing a correlation to activities/events and season normally attached to each month. As such, the poetry is neutral in this area. However, the artwork has opportunity. The artwork is well balanced in presenting/addressing gender, age, and economic status. However, it lacks diversity in the area of ethnicity. Theological Conversation Partners: This book offers wonderful opportunity to engage readers in discussion God’s creation (Genesis 1), Advent (with beginnings and waiting) and the changing order of the seasons (Ecclesiastes 3). What is your favorite month or time of the year? Why? What does your favorite month or time of the year tell you about God? What do you believe is God’s favorite month or time of the year? Why? Solomon writes that there is a time and season for everything. In what ways do you see that in this book? Share a prayer for God’s good creation with your learner(s). This review was written by Union Presbyterian Seminary student Lorenzo Small. Around the Year by Storypath is licensed under a Creative Commons Attribution-NonCommercial 4.0 International License.